The green synthesis of palladium oxide nanoparticles using Dictyota indica seaweed extract was investigated. Dictyotales is a large order in the brown algae (class Phaeophyceae). The color of the reaction mixture changed which indicated the formation of palladium oxide nanoparticles. UV-Visible, SEM, TEM, XRD, and FTIR analysis determined the characteristics of synthesized nanoparticles. The UV-Visible analysis showed the formation of palladium oxide nanoparticles. SEM and TEM analyses presented the palladium oxide nanoparticles have a spherical shape and based on DLS analysis with the average particle diameter of 19nm. The comparisons of the nanoparticle size with different biological synthesis were studied which revealed this methodology offer smallest size. The crystallographic parameters of the synthesized Pd nanoparticles were as follows: crystalline structure (cubic), space group (Fm-3m), and lattice parameter (a=5.6500, b=5.6500, c=5.6500, α=90, β=90, and γ=90). FTIR analysis indicated the presence of a palladium oxide group in the product. The removal efficacy of cadmium by the palladium oxide nanoparticles was investigated to optimize the pH, contact time, dose of adsorbent and concentration of cadmium. The results showed that optimum conditions for cadmium removal from water were obtained at pH 8, 500 mg/l adsorbent dose and 20 min contact time, wherein in these circumstances the removal of cadmium was 82.82%. The adsorption isotherms primacy was as follows, Langmuir R2=0.9904> Freundlich R2=0.9857> Temkin R2=0.8791. Palladium (Pd) is a transition metal and mostly used in the fields of environmental and material science. Catalytic converters, dental crowns, fuel cells, coating materials and so on are some examples of its applications . Recently, much attention has been paid to the synthesis of the palladium oxide nanoparticles due to the unique characteristics and potential application in various areas. The preparation of metal nanoparticles is usually carried out through chemical, physical and biological methods . Chemical and physical approaches are more expensive and required high pressure. These methods often produce toxic materials and harmful to the environment . In contrast, a biological approach has some advantages such as to be non-toxic, cost-effective, sustainable, environmentally and can be used without massive equipment and chemical materials . Biosynthesis of metallic nanoparticles has made extensive progress in terms of electronic, chemical, magnetic and optical properties. Particularly, palladium oxide nanoparticles that act as a catalyst at ambient temperature to oxidation and regeneration process and many organic and inorganic reactions have potential applications. In addition, due to the specific surface area having high reactivity and adsorption, the nanoparticles are used to eliminate environmental contaminants. Therefore, many researchers have considered palladium nanoparticles . Organisms that have been used for the synthesis of palladium nanoparticles until now consist of plants such as Oak fruit bark , Euphorbia thymifolia leaf , cyanobacteria  and alga such as Sargassum bovinum , Chlorella vulgaris. Biosynthesis of nanoparticles by using marine organisms such as alga can be performed by various compounds such as carbonyl groups, phenolics, flavonones, polysaccharides, proteins, amines, amides, alkaloids, and other reducing agents in the biological extracts . Brown alga refers to a category of marine macroalgae with halophytes pigments, which lives in the sea environment. Previous research revealed that these algae could mediate the synthesis of metal nanoparticles. For example, Sargassum genus has the ability to synthesize metallic NPs such as gold  and palladium . A few numbers of literature have been reported about the synthesis of silver and gold nanoparticle by Dictyota genus [13, 14]. Environmental pollution via heavy metals, with respect to their toxic nature and extent associated with industrial development, has attracted a lot of attention globally . Cadmium is a toxic heavy metal, which naturally enters the water through the various industries including plating, alloy manufacturing industries, the solar cells productions, and even domestic discharge and industrial sewage . Frequent use of water containing cadmium above this threshold level can cause several health issues for human beings. Since cadmium even at very low levels is harmful and toxic to humans, it should be removed from the water . There are many methods for heavy metals removal, especially cadmium, from aqueous solutions; some of these methods have limitations such as high cost and ineffectiveness, effectually when cadmium in low concentrations is dissolved in large volumes of water . Among other methods, adsorption due to its selectivity, low cost and flexibility has been one of the most impressive processes for heavy metals’ uptake, especially cadmium, even at low concentrations . 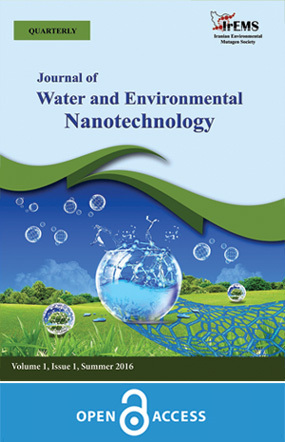 Therefore, considering non-toxic, cost-effective, sustainable, environment-friendly of biological synthesis of nanoparticles this study aimed to evaluate preparation of palladium oxide nanoparticles by Dictyota indica macroalgae and its application for removal of cadmium from aquatic solution. Dictyota indica was collected from Oman Sea coasts in Chabahar, Iran. Palladium (II) chloride (99% purity) was purchased from Merck Company. Double distilled water was used in the experiments. The wet biomass of the alga was kept in an incubator for drying at 45 ⁰C for 12 h. The algae sample powdered in a mortar. Then 2 g of alga powder was added in 200 ml of double-distilled water and boiled for 20 min at 60 °C. Then, it was centrifuged at 3000 rpm for 30 min and filtered through a Whatman filter paper. The obtained extract stored at 4 °C for future use. For the synthesis of palladium oxide nanoparticles, 10ml of aqueous PdCl2 solution (1mM) was added to 20 ml of the alga extract. The above mixture was shacked for 2h at 60 °C on a magnetic stirrer hot plate. The color of the reaction mixture changed which indicated the formation of palladium oxide nanoparticles. At this time, the color of the solution changed from yellow to dark brown. UV-visible spectra of samples (extract of algae, Palladium solution, PdNPs) were recorded using Ultraviolet-visible spectroscopy (Shimadzu, Japan) from 300-500 nm. Morphology of nanoparticles was characterized by a Scanning Electron Microscopy (SEM, Tescan Miraii, Cesko). Transmission Electron Microscope (TEM, CM120, Philips, Netherlands) was used to determine the shape and size of nanoparticles. The functional groups exist on the surface of the samples were obtained using Fourier-transform infrared spectroscopy (FTIR, Nicolet Avatar, Thermo, US) in the range of 4000-400 cm-1. The crystalline structure of nanoparticles was determined by X-ray diffraction (XRD, PW 1730, Philips, Netherlands). Dynamic Light Scattering (DLS) is used for nanoparticle size measurement (NANO-flex®180o , ParticleMetrix). Uptake experiments were conducted in the laboratory of Department of Natural Resources, the University of Birjand, in a batch system at 25±2° C. For optimization, the effect of some factors such as pH, adsorbent dosage, contact time and contaminants concentration was investigated in the ongoing process of cadmium and the optimal values were determined. The removal efficiency of cadmium was investigated by optimization of pH of the solution. So, the pH of solutions was regulated by NaOH and HNO3 at 10.5, 10, 9, 8, 7, 5 and 3 respectively and the other parameters were kept constant (contact time= 15 minutes, cadmium concentration= 3mg/l and adsorbent dosage= 300 mg/l). To obtain the concentration of 3 mg/l cadmium, the standard cadmium nitrate solution (Cd (NO3)2) was used. 1.5 ml of standard cadmium solution was poured in Erlenmeyer flask, then was brought to 500 ml volume by deionized distilled water. Later, 20 ml of prepared solution was poured in each Erlenmeyer flask and after setting the desired pH and addition of an adsorbent, was shaken for 15 minutes. Finally, the desired solution was filtered and the remaining cadmium in solution was determined by atomic absorption machine (ConterAA-700). To determine the optimal contact time, 20 ml of prepared cadmium solution was poured in each Erlenmeyer flask set at optimum pH obtained in the previous step. Then, 6 mg of palladium oxide nanoparticles adsorbent (300 mg/l) was added and shaken at 0, 2, 5, 10, 15, 20 and 30 minutes respectively, eventually the solution was filtered and the residual cadmium was measured. Concentrations of 200, 300, 400, 500, 700 and 900 mg/l sorbent, were added into the Erlenmeyer flasks containing 20 ml of cadmium solution with 3 mg/l concentration, and under optimal pH and contact time conditions achieved in the previous stages, the residual cadmium was read by atomic absorption machine. At this stage, by changing the concentration of cadmium at 0.2, 0.5, 0.8, 2, 5 and 10 mg/l, under optimal conditions (pH, contact time and adsorbent dosage) and the adsorption efficiency of cadmium was tested. In this equation, Ce is the equilibrium and Ci is the initial concentration of cadmium (mg/l). Percent of cadmium uptake (Up) is equal to the ratio of cadmium reduction after adsorption to the initial amount of cadmium in the solution . Under the condition that the solution concentration is at equilibrium, and temperature at constant, the relationship between the adsorbent and absorbate is called the adsorption isotherm . These isotherms are being used for analysis of the adsorption process and description of adsorbent behavior at an equilibrium state, besides assessment of performance and ability of an adsorbent in the removal of the heavy metals’ ions. In this study, after reviewing the optimal condition for cadmium removal from aqueous solution, Langmuir and Freundlich adsorption isotherms were adopted since in comparison to other models, are easier and have an ability to describe the experimental results in a wide range of concentrations and even Temkin model was compatible with the present data. Langmuir model: According to this model, adsorption is monolayer and adsorbent surface is homogeneous. In fact, absorption sites on the adsorbent surface are uniform and have equal energy and when the process reaches into an equilibrium, the adsorption speed and escape of molecules from the surface will be equal. Linear Langmuir form is the same as equation 2 . Freundlich model: This model states that the attraction is multi-tier and adsorbent surface is heterogeneous. In equations 2 and 3, KL is Langmuir constant, n and KF are Freundlich constants, Ce is adsorbate concentration in the liquid phase after achieving an equilibrium state (mg/l), qe is the ratio between adsorbate amount per unit weight of an adsorbent or in the other hand, is the adsorption capacity at equilibrium time (mg/g) and q max is the highest adsorption capacity (mg/g). Temkin model: In the Langmuir and Freundlich isotherm models, the interaction of different adsorbate materials on adsorbent is not considered in the adsorption process. So, Temkin and Pyzhev in 1940, with consideration of the efficacy of adsorbate interactions in adsorption process suggested an isotherm model known as Temkin model . According to this model, it can be said that adsorption energy owing to the interaction between adsorbate and adsorbent, decreases linearly along coated adsorbent surface . In this equation qe is the quantum of adsorbed metal ions at balance status (mg/g), B and KT are Temkin constants (B is related to adsorption heat (J/mol) and KT is constant of link in equilibrium condition (l/mg)), and Ce is a balanced concentration of metal in the solution (mg/g). Among the commonly used methods in the synthesis of nanoparticles (physical, chemical, and biological), biological synthesis is known as a new, green and environmentally friendly method. The preparation of palladium oxide nanoparticles was monitored by measuring the absorption of UV-visible in the range of 300-500 nm. The palladium solution situates at a peak located between 410-430 nm due to the existence of Pd(II) ions . As can be seen from Fig. 1 after adding alga extract to the metal solution, the reduction of palladium was started immediately its color changed from yellow to dark brown. The strong peak at 420 nm is due to the natural chemical constituents in the crude extract of algae, and this peak was disappeared after the reaction due to the combination between Pd and these natural chemical constituents in algae. The UV-visible absorption spectra PdCl2 solution, Pd nanoparticles and crude extract of alga were compared in Fig. 1. Reduction of palladium ions (Pd II) to palladium (Pd0) was monitored. As the Pd nanoparticles indicated continuous absorption in the range of 300–500 nm. Similar results have been reported for palladium oxide nanoparticles obtained by green synthesis method using different extracts such as oak fruit bark extract , and Chlorella vulgaris extract . The structure of palladium oxide nanoparticles was determined by XRD analysis (Fig. 2). Five strong peaks were observed at 31.73, 36.02, 40.60, 45.48 and 53.53 related to the Bragg reflections of (2 0 0), (2 2 0), (3 1 1), (2 2 2) and (4 0 0) planes of crystalline palladium oxide nanoparticles (JCPDS no. 03-065-5261). The crystallographic parameters of the synthesized Pd nanoparticles was as follows: crystalline structure (cubic), space group (Fm-3m), and lattice parameter (a = 5.6500, b = 5.6500, c = 5.6500, α = 90, β = 90 and γ = 90). The morphology of the palladium oxide nanoparticles synthesized using Dictyota alga extract was characterized by SEM and TEM analyses (Figs.3 and 4). As can be seen from these figures, the synthesized Pd nanoparticles have an approximately spherical shape. These findings in agreement with the results of the previous report which prepared Pd nanoparticles using Chlorella vulgaris extract  and Astraglmanna extract . Based on the DLS analysis the particle size distribution of the palladium oxide nanoparticles was determined with diameters ranging from 8 to 43nm and have the average diameter of 19 nm. Fig. 5 shows the FT-IR spectra of palladium oxide nanoparticles. The broad peak located at 3322 cm-1 was attributed to OH stretching vibration. This is probably due to the presence of physically absorbed water molecules on the surface of the palladium oxide nanoparticles . A band observed at 2929 cm-1 was related to alkane group (C-H). The absorption band at 1650 cm-1 was the characteristic peak for amide or C=C stretching vibrations of aromatic rings. The peaks at 1411 and 1130 cm-1 were ascribed to C-C and C-O stretching vibrations, respectively. The peak at 603 cm-1 corresponds to C–Br stretch of alkyl halides . One of the most important agents in the process of heavy metals removal is pH . Fig. 6 shows the efficacy of pH on cadmium removal by synthesized palladium oxide nanoparticles. Under the condition that the cadmium concentration in solution was 3 mg/l, the adsorbent dosage of 300 mg/l and contact time of 15 minutes, as depicted with increasing pH, the adsorption efficiency increased until at pH=3, the least adsorption rate (13.8%) was achieved. With pH increase to 5, the adsorption efficiency was at 40.06%, and subsequently at pH’s 7, 8, 9, 10 and 10.5 the adsorption efficiency increased to 49.56%, 68.62%, 82.82%, 91.07%, and 97.81%, respectively. Thus the other experimental procedures were performed at pH=8. Low adsorption in acidic pH can be explained as follows: in acidic pH, concentration of H+ in solution is at a high level, and at low pH, cadmium exists in solution as free cations of Cd2+, there is a competition between the H+ions and cadmium cations to occupy sites on the adsorbent surface  or high concentration and high mobility of H+ ions at low pH causes their higher adsorption in relation to the cadmium ions . The investigation results of the contact time efficacy in cadmium adsorption process, at solution pH of 8, an adsorbent dose of 300 mg/l, and cadmium concentration of 3 mg/l are shown in Fig. 7. As depicted, with an increase of cadmium and adsorbent contact time, the cadmium adsorption rate increases. Primarily, this increase was more and gradually it reached a constant level, i.e., from 14.6% adsorption rate at zero time increased to 39.4% after 2 minutes and 42.6% at 5 minutes. Finally, the adsorption efficiency from 50.7% at 20 minutes increased to 52.1% after 30 minutes. According to the results, the contact time of 20 minutes was selected for future experiments. The reason for rapid cadmium adsorption in the beginning and a slower adsorption in the remainder of the process is that, at first; all active sites on the adsorbent’s surface are empty and increases collision chance of cadmium ions with active sites. With time span and gradual binding of cadmium ions with active sites, the total number of active sites decreases and the adsorption process gets slower . Fig. 8 shows the efficacy of absorbent amount on the adsorption efficiency of cadmium. According to optimal values of pH and contact time that were determined in the previous section, experiments of this section were carried out at a pH=8, contact time of 20 minutes and cadmium concentration of 3 mg/l. With the increase in the adsorbent amount, the adsorption efficiency increased, i.e. from 87.8% at an adsorbent dose of 200 mg/l it increased to 96.65% at a dose of 900 mg/l. One of the reasons for increasing adsorption efficiency via increase of adsorbent’s concentration is that, with increasing adsorbent concentrations, more exchange sites are available and total adsorbent surface increases . It is interesting to note that the increasing rate of removal efficiency turns so low in the levels higher than 500 mg/l, and this may be due to the accumulation of sorbent particles in the high concentrations that lead to decrease in the total area of an adsorbent , but as the adsorbent concentration increases, the adsorption capacity decreases because, during the adsorption process, active sites are not saturated . The optimum adsorbent dose, according to the results of the present tests was selected as 500 mg/l. Efficacy of initial concentration of cadmium on the adsorption process was investigated, wherein the other factors (pH, contact time and adsorbent dose) were optimal, and the results are shown in Fig. 9. Increase in the cadmium concentrations has led to a reduction in the removal efficiency but increase in adsorption capacity. As demonstrated at the initial concentration of 0.2 mg/l cadmium, 97.7% of cadmium has been removed while at 10 mg/l concentration, the removal percentage decreased significantly and was equivalent to 38.22%. Initially, the cadmium concentrations were low and the entire exchange sites on the adsorbent’s surface were vacant, so not only the total adsorbent area was high, but also the adsorption efficiency. Gradually, with increasing cadmium concentrations, the number of available exchange sites was restricted and the cadmium ions competed to occupy the vacant sites. As a result, each ion’s chance is reduced to bind to the sorbent; therefore, the adsorption efficiency decreases . Increase in the adsorption capacity is associated with increasing concentrations of cadmium that can be related to an increase in the mobility of ions, which makes active sites occupied by more ions, and at the same time, the adsorption process is carried out better . So the optimal cadmium concentration was selected as 0.8 mg/l. In this study, the obtained data has been studied by Temkin, Langmuir, and Freundlich isotherm models, and the respective graphs are shown in Figs. 10, 11, 12 respectively. The comparison of correlation coefficients obtained from the charts; 0.9904 for Langmuir, 0.9857 for Freundlich and 0.8791 for Temkin models, indicated that the equilibrium data of cadmium corresponded well with the Langmuir and Freundlich isotherm models, but due to the higher correlation coefficient of Langmuir, this model can better predict cadmium adsorption by palladium oxide nanoparticles. Study of adsorption isotherms such as Redlich Peterson, Langmuir, Freundlich, and Temkin, showed that the most suitable isotherms for the removal of cadmium from water were as follows; Redlich-Peterson > Langmuir>Temkin> Freundlich, respectively . Palladium oxide nanoparticles were successfully synthesized by Dictyota extract. Continuous absorption in the range of 300–500 nm in UV-Visible spectra indicated the existence of palladium oxide nanoparticles with a size smaller than 9 nm which confirmed by TEM analysis. Based on JCPDS no. 03-065-5261, the nature of the obtained material was crystalline with a face-centered cubic structure. SEM and TEM analyses displayed that the synthesized nanoparticles have a spherical shape and based on DLS analysis with the average particle diameter of 19nm. Synthesized nanoparticles can be used as a low-risk and safe method with other methods in water treatment. The optimum conditions for the cadmium removal were obtained at the contact time of 20 minutes, pH of 8, adsorbent dose of 500 mg/l and initial cadmium concentration of 0.8 mg/l. The study of adsorption isotherms included: Temkin, Freundlich, and Langmuir wherein it exhibited that the Langmuir isotherm with a correlation coefficient of 0.9904 is the most appropriate isotherm for cadmium removal. The paper is from a postgraduate student thesis in the Department of Environmental Sciences of the University of Birjand. Thereby the authors appreciate of assistance Mrs. Ghafuri, and Laboratories in Natural Resources and environment and Science Schools University of Birjand during the course of the experiments and analysis. 1. Higashi A, Kishikawa N, Ohyama K, Kuroda N. A simple and highly selective fluorescent sensor for palladium based on benzofuran-2-boronic acid. Tetrahedron Letters. 2017;58(28):2774-8. 2. Shavel A, Cadavid D, Ibáñez M, Carrete A, Cabot A. Continuous Production of Cu2ZnSnS4 Nanocrystals in a Flow Reactor. Journal of the American Chemical Society. 2012;134(3):1438-41. 3. Liu G, Bai X. Biosynthesis of palladium nanoparticles using Poplar leaf extract and its application in Suzuki coupling reaction. IET Nanobiotechnology. 2017;11(3):310-6. 4. J. Anarkali, D.V. Raj, K. Rajathi, S. Sridhar, Biological synthesis of silver nanoparticles by using Mollugo nudicaulis extract and their antibacterial activity, Arch. Appl. Sci. Res 4 (2012) 1436-1441. 5. Veisi H, Hemmati S, Biabri PM, Safarimehr P. WITHDRAWN: Green synthesis and characterization of Palladium nanoparticles using Oak fruit bark extract: An efficient heterogeneous catalyst for aerobic oxidation of benzyl alcohols. Catalysis Today. 2017. 6. Nasrollahzadeh M, Sajadi SM. Green synthesis of Pd nanoparticles mediated by Euphorbia thymifolia L. leaf extract: Catalytic activity for cyanation of aryl iodides under ligand-free conditions. Journal of Colloid and Interface Science. 2016;469:191-5. 7. Lengke MF, Fleet ME, Southam G. Synthesis of Palladium Nanoparticles by Reaction of Filamentous Cyanobacterial Biomass with a Palladium(II) Chloride Complex. Langmuir. 2007;23(17):8982-7. 8. Momeni S, Nabipour I. A Simple Green Synthesis of Palladium Nanoparticles with Sargassum Alga and Their Electrocatalytic Activities Towards Hydrogen Peroxide. Applied Biochemistry and Biotechnology. 2015;176(7):1937-49. 9. Arsiya F, Sayadi MH, Sobhani S. Green synthesis of palladium nanoparticles using Chlorella vulgaris. Materials Letters. 2017;186:113-5. 10. Asmathunisha N, Kathiresan K. A review on biosynthesis of nanoparticles by marine organisms. Colloids and Surfaces B: Biointerfaces. 2013;103:283-7. 11. Azizi S, Ahmad MB, Namvar F, Mohamad R. Green biosynthesis and characterization of zinc oxide nanoparticles using brown marine macroalga Sargassum muticum aqueous extract. Materials Letters. 2014;116:275-7. 12. Singaravelu G, Arockiamary JS, Kumar VG, Govindaraju K. A novel extracellular synthesis of monodisperse gold nanoparticles using marine alga, Sargassum wightii Greville. Colloids and Surfaces B: Biointerfaces. 2007;57(1):97-101. 13. P SK, S u. Biosynthesis of Silver Nanoparticles From Dictyota Bartayresiana Extract and Their Antifungal Activity. Nano Biomedicine and Engineering. 2013;5(2). 14. J. Marimuthu Alias Antonysamy, S. Thangiah, R. Irulappan, Green Synthesis of Silver Nanoparticles using Dictyota bartayresiana J.V. Lamouroux and their Cytotoxic Potentials, International Biological and Biomedical Journal. 1 (2015) 112-118. 15. Ghorbani F, Younesi H, Ghasempouri SM, Zinatizadeh AA, Amini M, Daneshi A. Application of response surface methodology for optimization of cadmium biosorption in an aqueous solution by Saccharomyces cerevisiae. Chemical Engineering Journal. 2008;145(2):267-75. 16. Sayadi MH, Rezaei MR, Rezaei A. Sediment Toxicity and Ecological Risk of Trace Metals from Streams Surrounding a Municipal Solid Waste Landfill. Bulletin of Environmental Contamination and Toxicology. 2015;94(5):559-63. 17. Li Y-H, Wang S, Luan Z, Ding J, Xu C, Wu D. Adsorption of cadmium(II) from aqueous solution by surface oxidized carbon nanotubes. Carbon. 2003;41(5):1057-62. 18. Pérez-Marín AB, Zapata VM, Ortuño JF, Aguilar M, Sáez J, Lloréns M. Removal of cadmium from aqueous solutions by adsorption onto orange waste. Journal of Hazardous Materials. 2007;139(1):122-31. 19. Rajput S, Pittman CU, Mohan D. Magnetic magnetite (Fe 3 O 4 ) nanoparticle synthesis and applications for lead (Pb 2+ ) and chromium (Cr 6+ ) removal from water. Journal of Colloid and Interface Science. 2016;468:334-46. 20. Huang H, Cheng G, Chen L, Zhu X, Xu H. Lead (II) Removal from Aqueous Solution by Spent Agaricus bisporus: Determination of Optimum Process Condition Using Taguchi Method. Water, Air, and Soil Pollution. 2009;203(1-4):53-63. 21. Afkhami A, Saber-Tehrani M, Bagheri H. Simultaneous removal of heavy-metal ions in wastewater samples using nano-alumina modified with 2,4-dinitrophenylhydrazine. Journal of Hazardous Materials. 2010;181(1-3):836-44. 22. M. Nadeem, A. Mahmood, S.A. Shahid, Sorption of lead from aqueous solution by chemically modified carbon adsorbents, J. Hazard. Mater.138(2006)604–613. 23. Altın O, Özbelge HÖ, Doğu T. Use of General Purpose Adsorption Isotherms for Heavy Metal–Clay Mineral Interactions. Journal of Colloid and Interface Science. 1998;198(1):130-40. 24. Langmuir I. THE CONSTITUTION AND FUNDAMENTAL PROPERTIES OF SOLIDS AND LIQUIDS. PART I. SOLIDS. Journal of the American Chemical Society. 1916;38(11):2221-95. 25. H. M. F. Freundlich, Over the adsorption in solution, J. Phys. Chem. 57(1906)385-470. 26. M.I. Temkin, V. Pyzhev, Kinetics of ammonia synthesis on promoted iron catalyst, Acta Phys. Chim. USSR 12 (1940) 327–356. 27. Boparai HK, Joseph M, O’Carroll DM. Kinetics and thermodynamics of cadmium ion removal by adsorption onto nano zerovalent iron particles. Journal of Hazardous Materials. 2011;186(1):458-65. 28. Farhadi K, Pourhossein A, Forough M, Molaei R, Abdi A, Siyami A. Biosynthesis of Highly Dispersed Palladium Nanoparticles UsingAstraglmannaAqueous Extract. Journal of the Chinese Chemical Society. 2013;60(9):1144-9. 29. Sharmila G, Farzana Fathima M, Haries S, Geetha S, Manoj Kumar N, Muthukumaran C. Green synthesis, characterization and antibacterial efficacy of palladium nanoparticles synthesized using Filicium decipiens leaf extract. Journal of Molecular Structure. 2017;1138:35-40. 30. Madhavarao M, Ramesh A, Purnachandrarao G, Seshaiah K. Removal of copper and cadmium from the aqueous solutions by activated carbon derived from Ceiba pentandra hulls. Journal of Hazardous Materials. 2006;129(1-3):123-9. 31. Martinez M, Miralles N, Hidalgo S, Fiol N, Villaescusa I, Poch J. Removal of lead(II) and cadmium(II) from aqueous solutions using grape stalk waste. Journal of Hazardous Materials. 2006;133(1-3):203-11. 32. Annadurai G, Juang R, Lee D. Use of cellulose-based wastes for adsorption of dyes from aqueous solutions. Journal of Hazardous Materials. 2002;92(3):263-74. 33. Hafshejani LD, Nasab SB, Gholami RM, Moradzadeh M, Izadpanah Z, Hafshejani SB, et al. Removal of zinc and lead from aqueous solution by nanostructured cedar leaf ash as biosorbent. Journal of Molecular Liquids. 2015;211:448-56. 34. Naiya TK, Bhattacharya AK, Das SK. Adsorption of Cd(II) and Pb(II) from aqueous solutions on activated alumina. Journal of Colloid and Interface Science. 2009;333(1):14-26. 35. Garg U, Kaur MP, Jawa GK, Sud D, Garg VK. Removal of cadmium (II) from aqueous solutions by adsorption on agricultural waste biomass. Journal of Hazardous Materials. 2008;154(1-3):1149-57. 36. Wang FY, Wang H, Ma JW. Adsorption of cadmium (II) ions from aqueous solution by a new low-cost adsorbent—Bamboo charcoal. Journal of Hazardous Materials. 2010;177(1-3):300-6. 37. Han R, Li H, Li Y, Zhang J, Xiao H, Shi J. Biosorption of copper and lead ions by waste beer yeast. Journal of Hazardous Materials. 2006;137(3):1569-76. 38. Murugesan A, Ravikumar L, SathyaSelvaBala V, SenthilKumar P, Vidhyadevi T, Kirupha SD, et al. Removal of Pb(II), Cu(II) and Cd(II) ions from aqueous solution using polyazomethineamides: Equilibrium and kinetic approach. Desalination. 2011;271(1-3):199-208.